25 August 2015 – The Comboni Missionaries in South Sudan held a ceremony to mark the 50th Anniversary of Fr. Deng’s martyrdom. A thanksgiving mass was celebrated at Fr. Barnaba Deng House in Moroyok, Juba’s outskirt, this Sunday 23 August. A good number of people attended this celebration. Fr. Barnaba Deng House is a formation centre which has been named after Fr. Barnaba Deng, a Comboni Missionary who was martyred in South Sudan fifty years ago. Fr. Deng was born in 1935 near Kwajok (Bahr-el-Ghazal). His father died when he was still young. His mother took care of his education and allowed him to join the catechumenate, a group of elected people undergoing preparations to receive the Sacraments of Christian Initiation. He was eventually baptized and later joined the seminary to become a priest. While in the Major Seminary of Tore (South Sudan), he asked to become a Comboni Missionary. After a period of training, Barnaba Deng was ordained a missionary priest in Milan (Italy) on 7 April 1962 by Cardinal Montini, who became Pope Paul VI. Soon after his ordination, Fr. Barnaba Deng returned to South Sudan and ministered in Dei Zubeir, Raga, Gordhiim, Nyamlel and Aweil. In 1964 all foreigner missionaries were expelled from South Sudan. Only a few Sudanese priests remained with Bishop Ireneo Dud in Wau. Fr. Barnaba was in Aweil in charge of the parishes of Aweil, Gordihiim and Nyamlel. In 1965, while he was in Aweil, the police put its eye on him, looking for an occasion to eliminate him. The reason: in more than one occasion the priest had dared to take the defence of the people mistreated by the police or the soldiers. In August 1965 some friends informed him that soldiers were on their way to the mission to arrest him. He managed to escape and to reach the Bishop in Wau. But a military convoy coming from Aweil spotted him in the outskirts of Wau. I am father Barnaba Deng”, he answered, when asked to identify himself. At that very moment one of the soldiers shot him on the head and then again on the chest. Fr. Barnaba Deng died on the spot. It was 23 August 1965. The formation house in Juba was named after Fr. Barnaba Deng for good reasons. Fr. Barnaba was not the first Comboni Missionary from South Sudan, but he was the first South Sudanese Comboni Missionary to be martyred on 23 August 1965, in Wau, during the Anyanya liberation war. A year earlier he had approached one of the missionaries who were expelled to say: “Father, pray for us. We shall see each other only in heaven”. That seemed like a prophecy. This house was first opened in 1987 and due to the war it was moved to Khartoum, Nairobi and Kajo-keji and finally brought back to Juba. It is located in the area of Moroyok. Fr. Barnaba Deng House was inaugurated on 2 May 2015. However, it actually started operating two years ago, in Lomin, Kajo-Keji, as the ‘pre-postulancy’, a supplementary period of formation, a kind of “come and see” period, before candidates are admitted to the ‘Postulancy’ for philosophical studies. There are currently six young candidates from south Sudan undergoing training at Fr. Barnaba Deng House. Besides being a formation house for candidates to become missionaries, it also serves as a house for the elderly Comboni Missionaries. The Comboni Missionaries are an international Religious Congregation for missionary service, especially among people who do not yet know Jesus Christ. They are Brothers and Priests who dedicate their lives to the proclamation of the Gospel and various activities of human promotion. 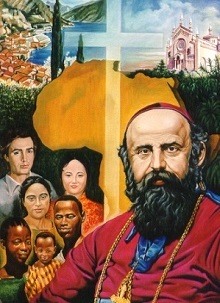 This missionary Institute was founded by St. Daniel Comboni (1831-1881), the first bishop of Central Africa. Today the Comboni Missionaries work in 41 countries in Africa, America, Europe and Asia. 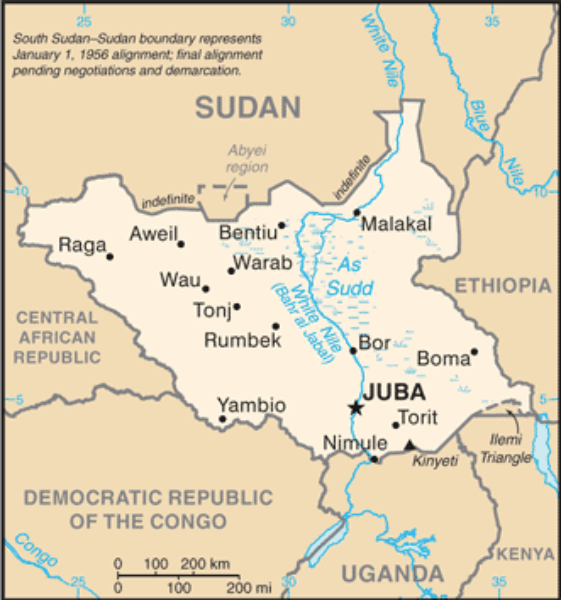 In South Sudan they are present in Wau diocese, Rumbek diocese, Yei diocese, Juba Archdiocese and Malakal diocese. They are missionaries from 16 nationalities: Mexico, Ecuador, Brazil, Peru, Poland, Spain, Portugal, Germany, Italy, Congo, Togo, Benin, Uganda, Ethiopia, USA, and South Sudan. Questa voce è stata pubblicata il 27/08/2015 da MJ in Church and religion, ENGLISH con tag Comboni Missionaries, Fr. 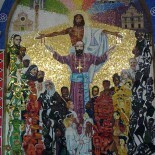 Barnaba Deng, Martyrdom, South Sudan, St. Daniel Comboni.